The Thunder’s blowout win in Golden State this week was extraordinarily impressive: it was the second worst home loss by the Warriors during the Kerr era (only their loss to San Antonio on opening night last year had a larger margin of loss). It also showed that Oklahoma City has some ingredients necessary to challenge the Warriors in the playoffs, should they meet: in particular, the ability to force a high volume of turnovers. The Thunder rank #1 in the NBA in forced turnovers, and forcing the Warriors to cough up the ball is one of the keys to beating them. In Golden State’s 11 highest turnover games they are just 4-7, while in the 22 games where they have a lower than average number of turnovers they are 21-1. In their matchup with the Thunder, the Warriors turned the ball over at one of the highest rates of any team in any game this season: of the 815 games played thus far, only 10 teams have turned the ball over more often per possession in a game than the Warriors did against OKC. That is one of the big picture takeaways from their Tuesday night matchup. But I’m not going to focus on that here. We’ll revisit that if we’re fortunate enough to see them square off in the postseason. Instead, I want to follow the typical theme of Friday Film and look at two clips from the first quarter that can teach us about basketball on a larger scale. The first came with six-and-a-half minutes left in the first quarter when Steph Curry came off a simple drag screen with Zaza Pachulia. 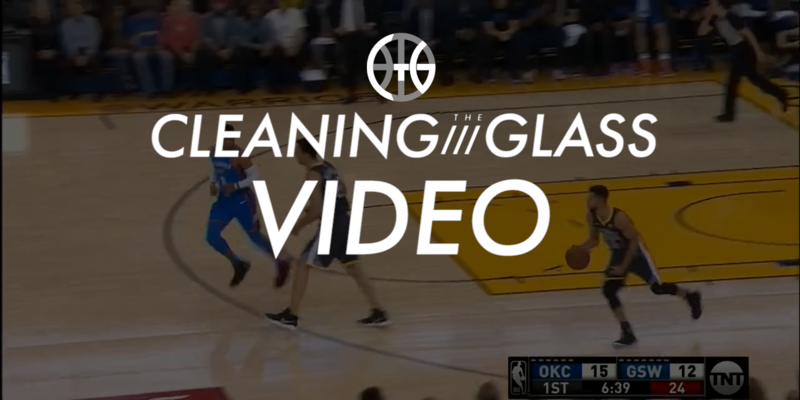 It was an instructive clip to see how Steph is able to use intelligence and anticipation to make the right play even against superior athleticism. As Curry comes off the screen he sees Jerami Grant, a rangy shot blocker, sitting in the paint. But he remains calm. Instead of embarking on the fool’s errand of attempting to beat Grant to the glass, he uses guile, not speed. He looks up at the rim and gathers the ball, making Grant believe he’s about to go for a layup — a layup that Grant would easily pin against the backboard. Curry, of course, has no such thing in mind, but Grant’s instincts take over. He sees a gather, a one-two step, a raised ball, and he springs off the floor. Which is exactly what Curry wanted. 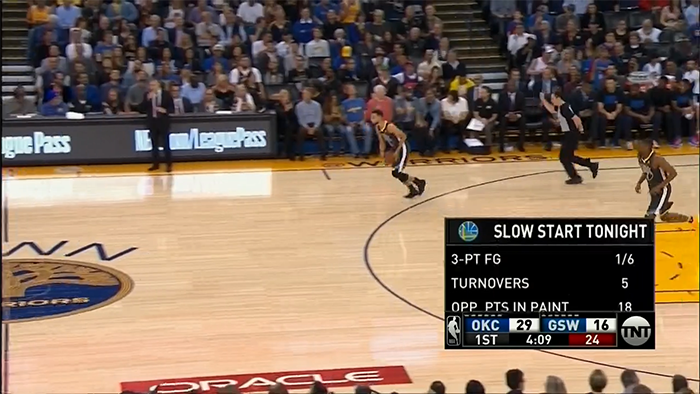 That opens up Grant’s man, Pachulia, on the roll. So Curry hangs in the air, ducks around Grant, and drops the ball off for a layup. 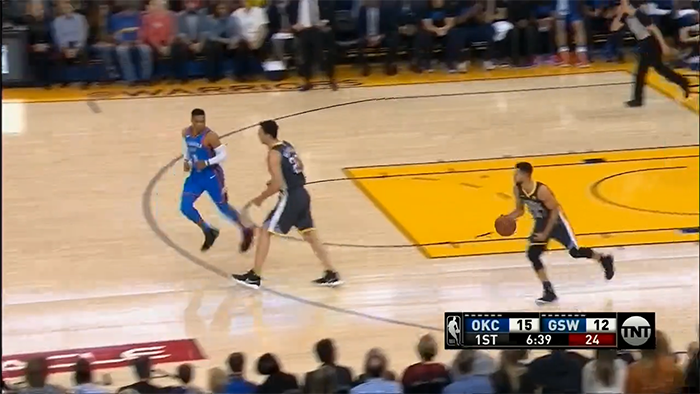 Another thing to notice in this clip is that there is no weakside help to take away this pass to Pachulia. Usually this would be Paul George’s responsibility, but he’s so concerned with Durant he barely takes a step away from him and isn’t in any position to take away Curry’s pass. That George almost does it (he got in a pretty good shot contest) is a testament to George’s off-ball instincts, quickness, and length. That Durant cans the shot anyway, seemingly unbothered by George’s closeout, is why he didn’t want to leave him in the first place.